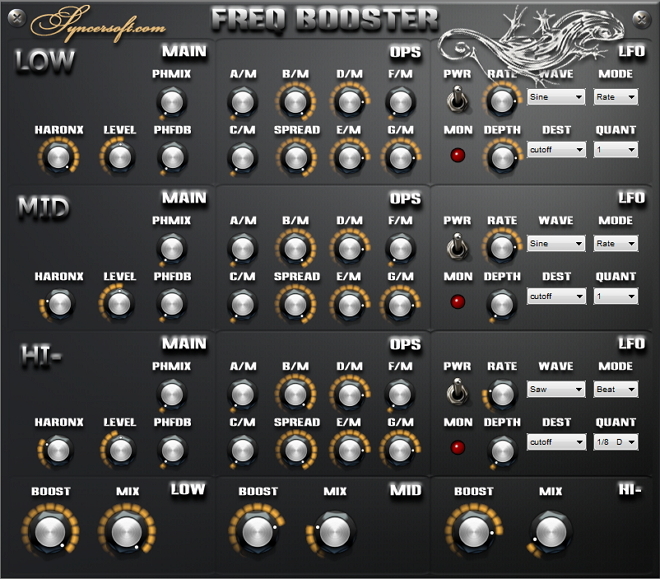 Freq Booster VST is revolutionary plugin that enriches sound with creation of new harmonics using algorythm based on unique new psychoacoustic algorythm: crossmodulation of harmonic operators and imposition of new frequiencies. Plugin creates effect of intellectual boosting of frequency in terms of Intellectual Information Technology (IIT) Development of this plugin was inspired also by psychoacoustics research of Shleenkin Alexandr and russian works on mathematical physics. This plugin is designed to bring warm and phat sound to modern digital music. With help of it you can create necessary amount of sound harmonics to drumloops, kicks, guitar, boring digital synth or even to final mix. Creation of new harmonics without using eqalisation is a main sense of this plugin. Its good to use it in dance, techno, dubstep, electronica, drum n bass, big beat, dub, reggae and all other styles. Harmonic operators section define psychoacustic effect of sound. Operators modulate each other in a special way that open a venue to experiment and possibility to achieve sound that you want. LFO section was designed specialy for Dubstep genre but can be used in other styles too of course. With help of this section you can control pulsation of harmonics with temp syncing or manually. Put this plugin at insert to some boring digitall bass line and assign rate, depth, cutoff knobs to midi controllers to create it floating, pulsating Dubstep Base sound. Main feature of this plugin is separate processing of low medium and high frequency. To assign controller to knob make a right click of the mouse on virtuall controller and you will see pop-up menu where you can choose controller. This site does not contain serial number, crack, keygen Freq Booster serial number : serial number is the simplest type of crack. A serial number(cdkey,product key,etc) is register the program as you may already know. a crack or keygen may contain harmful software. If you cannot find the exact version you want, just give it a try. for more information read .nfo/.txt/.diz file include in zipped file.